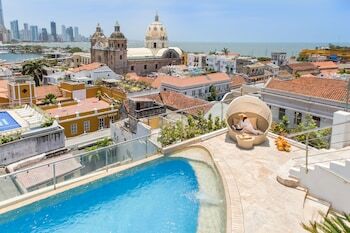 With a stay at Movich Hotel Cartagena de Indias, you'll be centrally located in Cartagena, steps from San Pedro Claver Church and Convent and 4 minutes by foot from Puerta del Reloj. Featured amenities include dry cleaning/laundry services, a 24-hour front desk, and multilingual staff. Planning an event in Cartagena? This hotel has facilities measuring 775 square feet (72 square meters), including a meeting room. A roundtrip airport shuttle is provided for a surcharge (available 24 hours). With a stay at Hotel Cocoliso Island Resort in Isla Grande, you'll be by the sea and close to Isla Grande Beach and Rosario Islands Oceanarium. A ferry terminal shuttle is available for a surcharge. With a stay at Hotel San Jeronimo in Armenia, you'll be within a 10-minute drive of Metropolitan Cultural Convention Centre of Quindío and Parque De La Vida.